Go here to see a performance that James gave last year. God bless you and him always!!! Pray for James, y'all, if its not asking too much. The beautiful sweet hearted teddy bear had surgery on one of his shoulders Monday. What a way to start out the new year, may James feel better soon! P.S. James made it in there last month for two Grammy awards, may they both go to him on the 8th of next month! Best Country Song for co-writing the song named "In Color"
Go here to help me get James in there for the ACM Best New Artist of the Year award. Hey! If it isn't asking too much, please go here to help me keep my most favorite singer, James Otto, in the game for the CMT Breakthrough Video of the Year award!!! P.S. In order to vote, you will have to register, and I believe that the last day to vote during this time will be May 11th. Tomorrow is the final day to cast your vote for who you would love to see have a final nomination for the 2009 CMT Music Video awards! Go here to help me keep James in the game for the Breakthrough Video of the Year award!!! Well James did make it in there for one award, though to me, the award seems to be more of an after thought which to me is a flat out insult, but it is something for him to win, so if you want to see it go to him, go here to help me make it happen for him. P.S. The voting for this award closes up on June 5th, but until then, you can vote as many times as you want to. Tomorrow is the day that the voting closes up for the CMT On Your Side award, so go here to get them votes in there for James while you still can if you haven't already and remember you can vote for him as many times as you want to. James played the Opry this past Tuesday night and you can listen to him here if you missed him! His time is just 44 minutes into the clip that starts playing! Go here to help get the newest video from James into the GAC Top 20 Count Down! A clip of the song named "Are You With Me" from the new album named Shake What God Gave You! set to be in stores on September 14th can now be listened to over at the official website for James, but on the day after tomorrow it may be taken away because a clip of another song from the new album will then be put up there for us to hear! P.S. Go here to be at his official website. Go here to see what James had to say about last night's Teen Choice Awards show. To see him say such things only makes me even more proud to be a fan of his, I love him SO much!!! Three new clips of his new album have gone up over at his official website. If you have never seen James live, you are missing a lot. His voice is even better when its right there in front of you! Then there's the rest of him which in my opinion couldn't be more precious, beautiful, & sweet hearted either!!! "A Groovy Little Summer Song"
"Its A Good Time For A Good Time"
"Shake What God Gave Ya!" "Till That Sun Comes Around Again"
"I Just Got Started Loving You"
P.S. There is more that I have to tell about my getting to see him, but since this isn't a forum for him, I'll be quiet until someone asks me to share the rest. ^^^ A picture of us together was taken before and after the show and I was told that the first one will be on the WIVK website!!! That is not everything though! When the second shot of us together was taken after the show I had to go of course once it was done and when it was, James said what I never thought that I would ever hear him say to me...James said "I love you" to me and them words came from him first! That is still not all! Early yesterday morning before I went off for the day, I left James a message at his twitter page letting him know that things did not look good for me at getting to see him and that if I didn't get to be there that I am so sorry. James wrote back to me saying that if a ticket is what I needed, that I would be taken care of...by him!!! If I didn't know any better, I would think that precious beautiful sweet hearted teddy bear is an angel in disguise!!! That is still not all! Before the show started, I was able to talk to a couple of the WIVK DJs and one of them got to be the one to talk to James on the radio earlier. They told me that James brought me up during the radio chat! The sad thing is that I missed it because I was not able to listen to the radio at the time and right now I am trying my absolute hardest to get that chat sent to me over the computer from the radio station if that is even possible which it has been done for me one time in the past. I want to know of course what was said exactly. 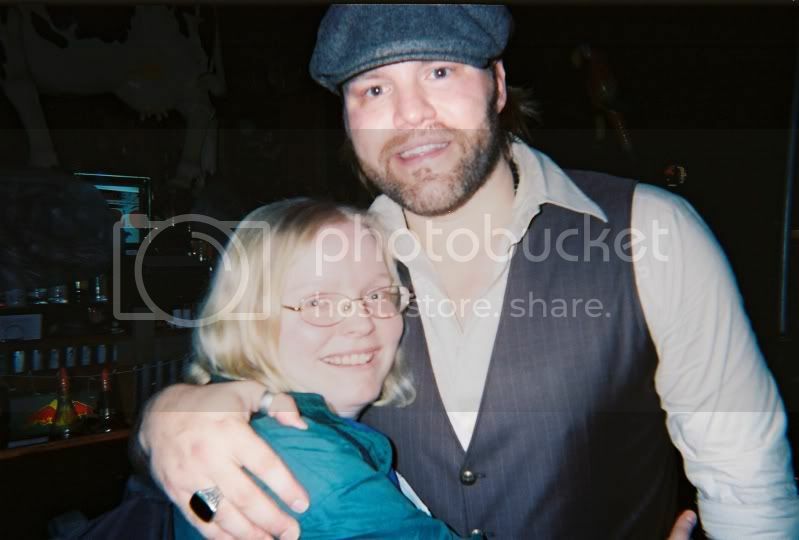 Oh and when I met him before the show, I gave him presents that I was able to get for him and his wife and little girl.